In Charleston you feel the history. Small in size and scale, tucked in among the mysterious, fertile salt marsh of the Lowcountry, somewhat off the beaten path, it is a picturesque, genteel and historic jewel. Hundreds of splendidly preserved historic structures, spared by Sherman during his march to the sea, rebuilt after natural disasters, and preserved through efforts of its citizens, stand proudly along charming streets, giving Charleston a timeless quality and the appearance of time frozen. Amazing architecture is just one chapter in Charleston's spellbinding story. Uniquely influenced by its English, Barbadian and African heritage, this is a graceful city, charming to be in, a delight to explore. This historic seaport town is also worldly, shaped by the coming and going of people bringing goods and ideas "from away." From the beginning, Charles Town was unique. Unlike the settlements in Virginia and New England, which were founded for political or religious reasons, Charles Town was established in 1670 by British adventurers with close ties to the West Indian island of Barbados, solely for the purpose of trade and commerce. During the early years of the colony, products from the wilderness, beaver fur and deerskin, quickly followed by lumber and tar used in ship building, were traded. Next, planters began to grow rice and indigo on large tracts of land up the Ashley and Cooper Rivers, sending the products downriver to the growing port town for shipment by merchants. Sailing vessels from all parts of the globe lined Charles Town's busy docks and wharves, engaged in lucrative trade. Slaves were also openly traded along the wharves, as the success of the rice plantations was dependent on the use of slave labor, a practice and way of life brought to the colony by way of Barbados. The slaves not only provided the labor for rice cultivation, but the great success of "Carolina Gold," was attributable to the centuries old cultivation methods slaves brought from Africa. 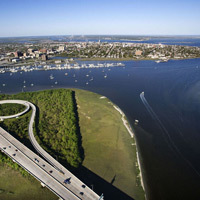 During the 18th century, the wealthy port town of Charles Town was the major city in the southern half of North America. Planters grew what merchants shipped; merchants, in turn, brought in the fine goods that the people of Charles Town and surrounding plantations enjoyed and came to expect. Using acclaimed architects and the finest materials, the wealthy merchants and planters built extravagant residences in Charles Town and filled them with the finest appointments. Today, hundreds of these fabulously restored homes, testaments to the worldliness of the early residents, can be seen simply by walking along Charleston's charming streets. The range of historic homes is breathtaking; the architectural details astounding. In addition to the English and the Barbadians, self-made men from France, Ireland, Scotland, and Germany, eager to attain wealth through the land and in trade, were drawn to the thriving community, becoming prosperous and further diversifying it. In tolerant Charles Town, its residents enjoyed the good life, living and entertaining in their opulent homes. Unrestricted by religious mores, there were lavish parties, dinners and balls; drink, cards, and horse racing; music, dance and theater, pastimes that began in colonial Charles Town and continued on into anti-bellum Charleston. As the most cosmopolitan city in America, it was the place to be seen, to entertain, and to show off wealth. Ladies dressed in imported silk; gentlemen sipped fine Madeira from Portugal. Extraordinary wealth, close ties to Europe, and an environment of tolerance also positioned early Charles Town as the cultural center of colonial America. In the early part of the 18th century, the St. Cecilia Society was established to bring concert music to Charles Town, a tradition that remains today in the cultural offerings at the globally acclaimed Spoleto Festival USA , which draws thousands to Charleston every May. As early as 1736, professional traveling companies entertained with theatrical productions in the New Theatre on Dock Street Street, now the Dock Street Theater . Residents could borrow books from their public library, the first in America, established in 1743. Wealth and the easy life were not all that shaped Charleston. This is a city whose graciousness masks the grit and determination of a people who endured many hardships. After suffering immensely during the Civil War, life and order as Charlestonians, both black and white, knew it, vanished. Slavery was abolished, the plantation economy changed, wealth was lost or re-distributed. It was not until the early 20 th century that the community began to recover from the ravages of a society turned upside down. In the tumultuous times after the Civil War, it was determination, pride, and a deep respect for tradition that preserved Charleston's timeless beauty for future generations. Many of the nearly destitute former elite made ends meet by taking in any work they could, hanging on to their homes and vestiges of their former lives. Living in genteel poverty, "too poor to paint, too proud to whitewash," deteriorating homes were clung to and kept in the family. This same sense of pride in place led Charlestonians in 1931 to become the first city in America to pass a preservation ordinance protecting entire neighborhoods, not just individual places, thus ensuring Charleston's place in history. Her city seal sums it simply: "She guards her buildings, customs and laws." 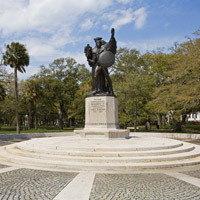 Of equal importance to the uniqueness of Charleston is the influence of African culture and the culture of the slave experience. It permeates everything in the Lowcountry - agricultural methods, decorative architectural elements, music, food. While huge numbers of slaves were plantation field hands, in Charleston they were blacksmiths, carpenters, masons, shipbuilders, seamstresses, tailors and bakers. Through a complicated registration system, these skilled slaves were hired out, becoming indispensable to city life, and able to move freely about town as long as they wore a "badge," a tag made of copper and stamped with their skills. Following the civil war, Charleston was a magnet to many of the 400,000 slaves freed in South Carolina alone, creating a city more black than white, further influencing the culture of Charleston. Today, people from all over the globe are drawn to the magic that is Charleston. They come, eager to soak in the unique and timeless ambience and to take in the visual delights. A walk through historic Charleston is one of joyous discovery: Barbadian "single" houses in rainbow colors with piazza's to catch the breeze; porch ceilings painted the "haint" blue of Gullah superstition; formal English gardens hidden beyond the delicate filigree of wrought iron gates, first crafted by skilled slave blacksmiths; carved pineapples on entrance gates, a sign of welcome in the tradition established by sea captains signaling their return; classic columns in a progression of orders gracing entrances of former town homes of gentlemen planters; church steeples rising in architectural contrast above the low-scale skyline, reminders of the city's acceptance of diversity. Charleston is the sound of white tabby walkways, crunching underfoot, remnants from the nearby fertile oyster beds; the burnt look of Charleston gray brick, the color of the land; the statement made by Charleston's signature green shutters - 2 parts "Yankee" black and 1 part "rebel" yellow. It is a city whose soft sea air is permeated with the sensuous fragrances of jasmine, laced with the soft sounds of Gullah, and filled with the aroma of wonderful Lowcountry cooking, created in part from the bounty of the surrounding sea - oysters, she-crabs, shrimp; in part from the productive land - okra, hominy grits, black-eyed peas and collard greens. Charleston is staying in an antique-filled Bed & Breakfast, where breakfast is served on a silver tray. It's discovering gardens hidden behind entrances elegantly framed in fragrant jasmine and draped in the cascading purple of wisteria. With more restaurants per capita than any city in America, it's a foodie's delight of menus laced with savory Lowcountry ingredients served in lovely settings - roasted red snapper with Lowcountry succotash and shrimp at Anson, she-crab soup at 82 Queen, brunch on blackened shrimp and scallops with grit cakes in the Barbados Room, heavenly praline soufflé at High Cotton. Browse for antiques along King Street, find traditional sweet grass baskets at City Market , climb through historic Fort Sumter, where the first shot of the Civil War was fired. Walk down Church Street , where St. Philips Church , in the English way, juts out into the brick roadway, and down cobblestone Chalmers Street, to the Pink House , the oldest masonry house in Charleston, built in 1690. See the city on a leisurely horse-drawn carriage ride. Admire the "free-flying" staircase and period furniture at the Nathaniel Russell House; see the only historic 18th century kitchen open to the public in the Heyward-Washington House (1772); glimpse the opulent life-style of a wealthy rice planter in the Joseph Manigault House (1803); stroll past the elegant homes along the Battery; linger awhile on a battery bench in White Point Gardens. Drive out Ashley River Road to experience 18 th century plantations. Watch actors demonstrate the skills of slave artisans on the plantation at Middleton Place. Spend an afternoon surrounded by the sheer beauty of Magnolia Plantation & Gardens , where there is always something glorious blooming. See the most significant Georgian Palladian home in America, Drayton Hall, a plantation house remarkably intact and unchanged since 1738, retained in the Drayton family until 1974, when ownership was transferred to the National Trust for Historic Preservation. Treat yourself to Charleston - its architecture, culinary delights, sumptuous lodging, and gracious demeanor, layered in history and veiled, ever so lightly, in mystery. 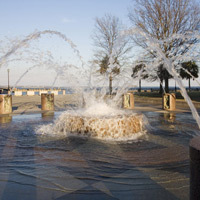 With temperatures hovering on the warmer side of each of the four seasons, Charleston's climate is never really extreme, and sea breezes coming off the Atlantic give it a definite semi-tropical feel - steamy hot in the summer months, delightful in the spring and fall, and comfortable in the winter. Charleston is enjoyable year-round. The historic old city is best explored on foot, making the spring months, when the air is cooler and flowers of every variety are in full bloom, the loveliest and most comfortable time to visit. It is, however, peak tourist season and the most crowded time. Most locals find March through October to be the best time to enjoy the myriad of outdoor activities - golfing, tennis, sport fishing, kayaking, hiking, swimming off the barrier island beaches. But, for those not acclimated to the area, the humidly hot summers may take some getting used to. Pleasant weather and lovely settings - charming streetscapes, lovely gardens, landscaped lawns of former plantations, jewel-like historic venues - serve as a delightful backdrop for annual events enjoyed by everyone. In cool January, Boone Hall Plantation in Mt. Pleasant celebrates the oyster harvest, with oysters served straight from steaming buckets, during the Low Country Oyster Festival. In February, the Southeastern Wildlife Exposition, the largest collection of wildlife art anywhere, showcases the beauty of wildlife found in the surrounding woods, marshland, estuaries and ocean, through the work of sculptors, painters, photographers and carvers. In March through late April, Charleston is painted in the brilliant color of the peak blooming season. It's a wonderful time to walk through historic neighborhoods and private gardens during the Festival of Houses & Gardens and the Garden Club of Charleston House & Garden Tours. For one weekend in mid-March, fine antiques and period furnishings are showcased at the Charleston International Antiques Show. In cool March, stroll leisurely through the great selection of regional art at the French Quarter Art Walk, taste the flavors of the region in the Distinctively Charleston Food & Wine Festival, drive up to Summerville for the glorious Flowertown Festival. Charleston's signature event, Spoleto Festival USA, held in delightful late May and early June is 17 joyous days of acclaimed productions of dramatic opera, soulful jazz, classical ballet, spirited contemporary dance, highly polished professional theatre, and fine chamber music. Featuring international talent, and held in remarkable venues throughout the city, the festival attracts a world-wide audience. The offerings are astounding. The month-long Fall Tours of Homes & Gardens at the end of September, is a great time to see the gardens of Charleston dressed in full autumnal color. During the Candlelight Tour of Homes & Gardens, Charleston takes on an almost surreal glow. The MOJA Festival, also at the end of September, celebrates the region's rich African-American heritage with performances, tours, concerts and exhibits. The senses are once again stimulated in October by the French Quarter Art Walk and The Taste of Charleston. Every Saturday in November, get a feel for life on a plantation on the Ashley River during Plantation Days at Middleton Place. In December, Charleston lights up elegantly, making a stroll through the historic city an even greater delight. The population of the historic old city of Charleston, lying between the Ashley and Cooper rivers, is limited by its containing geography. The 2007 population estimates for the "Peninsula," as it is commonly known, is 36,313. Limited by geography, the City of Charleston's growth has been forced northward, off the Peninsula, and has a total population of 118,492. The population of the City of Charleston and the surrounding metro area, the "Trident Area," is just over 600,000. 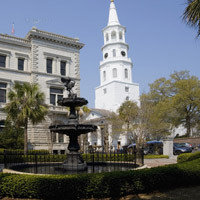 Charleston's 8 square-mile old city, the "Peninsula," is bound by the Ashley and Cooper rivers and is surrounded by salt marsh, estuaries, shallow creeks, oyster beds and the barrier islands of South Carolina's Lowcountry, along the Atlantic Ocean. The larger "Trident Area," encompassing Charleston, Berkeley and Dorchester counties, is 104.31 square miles, and has interesting Lowcountry communities and sites to visit. Remoteness, the very thing that has made Charleston unique, also places it somewhat "off-the-beaten" path, and it takes awhile to get there from I-95, South Carolina's main north/south thoroughfare. • By car. Coming into the city by car, there are two choices. The scenic route, coming up from the south off I-95, is the Savannah Highway, or US Highway 17S. This drive is a fascinating one, through Beaufort and the saltmarshes and estuaries in the Lowcountry. The other, and faster, route is via I-26, straight into the city. •By air. Several major carriers serve Charleston International Airport, located in North Charleston, 12 miles west of the historic city. The taxi fare into the city is about $25, excluding tip, and an airport shuttle service is available. Some hotels offer a shuttle service, and major rental car companies have airport facilities. •Parking. There are public lots and garages throughout the city. Whether you are spending a few days, or are in for just a day, park your car and take in the sights of Charleston on foot. Use the car only to drive out into the hauntingly beautiful Lowcountry to see the plantation museums, visit fishing towns tucked in the marshes and along the estuaries, or to enjoy the barrier islands, with their lovely beaches, parks and golf-courses. •Walking. In the small, compact historic city, walking is the best way to get around. And, it's made easy by the grid pattern layout of the streets. The main north-south streets are King, Meeting and East Bay. The primary east-west streets are Tradd, Broad, Queen, and Calhoun. •Downtown Area Shuttle (DASH), the easily recognizable, green, turn-of-the-century trolley, travels throughout the historic city, providing a way to get around if you don't want to walk everywhere. Trolleys only stop at designated, signed trolley stops, and the $1.25 exact change fare can be purchased upon boarding. Transfers (25 cents), $4.00 All-Day passes and $10, 10-ride passes are available at the very helpful Visitor Reception & Transportation at 375 Meeting Street, located close to the Peninsula entrance off I-26. While there, pick up the very helpful, free The Map Guide - Charleston. •Taxis. There is taxi service in town, but taxis are not permitted to pick up fares along the streets. They must be called for in advance. Lodging establishments in the Charleston area are, in one word, delightful, and are very much a part of the total Charleston experience. Whether a luxurious hotel, a comfortable motel, or an intimate inn, all have a common denominator - a naturally gracious hospitality, the kind that makes you want to return, again and again. Who would not enjoy a pleasant greeting upon returning from a day of sightseeing, afternoon tea on the piazza, breakfast served in a private garden, turn-down service accompanied by chocolate and brandy. Accommodation choices are many. Grand hotels have impressive lobbies and soaring atriums, anti-bellum décor and fine antiques. Comfortably consistent name-brand motels, some in the heart of the historic district, others along the Ashley River, provide pleasant and convenient stays. Quaint inns and intimate Bed & Breakfasts in historic homes with heirloom-filled rooms, hold fascinating stories and offer unparallel hospitality. Experience the sea islands in inns on the saltmarsh, shimmering gold in the glow of sunset, or in beachfront cottages along the dunes overlooking the Atlantic Ocean. Enjoy the luxury of full service ocean-front resorts with challenging, picturesque golf courses designed by the world's best golf course designers. Over four million visitors come to Charleston each year, for the sights, the culinary creativity, and for an immersion into the city's genteel hospitality, graciously delivered by the proprietors and staff of all the area accommodations. During the lovely spring months, Spoleto Festival, and holiday weekends, be sure to make reservations well in advance. 1) Discover historic Charleston on foot. Put on your walking shoes, and with map in hand (along with one of several walking tour books or a book on Charleston architecture), follow your own path! You'll delight in your discoveries! The number of meticulously restored and maintained historic buildings and delightful garden spaces draped in color is astounding. Adding to the charm of Charleston, residents and businesses live side by side in these wonderful buildings, many once-private mansions, and it is not always clear which are residences, which are businesses, and which are historic sites. There is no other city quite like it. 2) Tour a house museum. While most of Charleston's vast collection of historic Buildings - 73 pre-Revolutionary War, 136 late 18th century, and over 600 pre-dating 1840 - are privately owned and not open to the public, those that are provide a real feel for life in Charleston from the before the Revolution to the Civil War. Heyward Washington House (1772) George Washington stayed here in 1791 on his presidential grand tour of the country. Built by the "Rice King," the wealthy rice planter father of Thomas Heyward, Jr., a signer of the Declaration of Independence, it is filled with fine period furniture, much of it made in Charleston. On mantels and cabinets, look for designs of the figure 8 with 4 diamonds, signature carvings of Thomas Elfe, one of America's best cabinetmakers. The 18th century kitchen behind the house is the only historic kitchen open to the public. Joseph Manigault House (1803) Lovely in the delicate Adams Federal style popular after the American Revolution, it exhibits the worldly sophistication of its original owner and many early Charlestonians. The curving central staircase is remarkable, as is the outstanding collection of period furnishings. The rice plants carvings in the bedposts on the mahogany beds reveal the importance of "Carolina Gold" in the wealth of the planter community in which the Manigaults were important players. Nathaniel Russell House (1808) One of America's finest examples of the Adams architecture, it was built by Nathaniel Russell, the richest merchant in the Post-Revolutionary period. Its most famous feature is a free-flying staircase, spiraling upwards, seemingly unsupported, for 3 floors. The main rooms are notable for having different geometric shapes, square, rectangular an oval, and the gardens, initially planted under the direction of Russell's wife and daughters, are lovely. Aiken-Rhett House (1817) Astoundingly unique in that it has been preserved, not restored, looking as it did in 1858, thereby providing an unvarnished insight into pre-civil war town life. The outbuildings behind the house - slave quarters over the kitchen, privies, and stables, offer a simple statement of the realities of life during that era. Edmonston-Alston House (1825) Built on the High Battery by a wealthy merchant overlooking his interests in the harbor, the elegant Greek Revival home has original heirloom furnishings, wonderful silver pieces, family portraits and, quite remarkably, Charles Alston's nearly intact library. Calhoun Mansion (1876) Constructed during the dark days of post Civil War Charleston, when very few mansions were built, the Victoria-era excess of this enormous, exquisitely appointed 24,000 square foot house just off the Battery is a rare sight. 4) Visit the early Ashley River plantations. No visit to Charleston would be complete without seeing the land along the river, the genesis of Charleston's fabulous wealth. Drive out Ashley River Road, under the canopy of ancient oaks to Drayton Hall, Magnolia Plantation and Gardens and Middleton Place, all pre-dating the Revolutionary War. 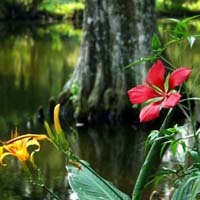 Magnolia Plantation and Gardens, famous for its exquisite gardens dates back to 1676, when the land was settled by Thomas Drayton from Barbados. There's always something blooming in the magnificent gardens, the oldest garden in America. First planted in 1680, it was opened to the public in 1870. Hundreds of azaleas, exuberant in splendid pinks and purples, were introduced to America by the Reverend John Grimke Drayton in the mid 1800s, and over 900 varieties of camellia, in colors ranging from white to red, and in every imaginable shade of pink, bloom in glorious color. Paddle a canoe through the wildlife refuge created by the permanent flooding of old rice fields; visit the magical Audubon Swamp Garden; climb the observation tower for views of the river; visit a slave cabin; see an old rice barge. Drayton Hall, standing singularly on a knoll, dates back to 1738, and is as it was in colonial America. The rice plantation of the son of Thomas Drayton was only recently turned over to the National Trust for Historic Preservation by the Drayton family. While it has no gardens to stroll through, no furnishings to admire, it stands as an architectural treasure, the finest example of Georgian-Palladian architecture in America. The sole survivor of the burning of the plantations along the Ashley River by Union troops in 1865, it is relatively unchanged by the passage of time, tragedy and modernization. Middleton Place, the home of Henry Middleton, president of the First Continental Congress and his son, Arthur Middleton, signer of the Declaration of Independence, illustrates the enormous size and scope of the early plantations. The 65-acre formal, geometric garden terracing down to the Ashley River was planted in 1741, through 12 years of labor by over 100 slaves, and is the oldest landscaped garden in America. The first camellias in America were planted here, and three of these specimens are still alive on the plantation grounds. Re-enactments of plantation life depict the magnitude of the work carried out daily and a mouth-watering plantation lunch - corn pudding, Hoppin John, okra gumbo and she-crab soup - or dinner of quail and broiled oyster is served in the Middleton Place Restaurant, in a replica of an old rice mill. 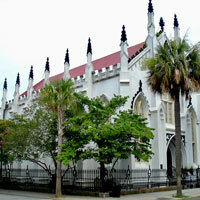 5) Visit the historic 18th and 19th century churches in the "Holy City." All are interesting, each is distinct. 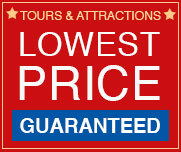 Some offer guided tours, others do not. If the door is open, walk inside; if not, there is plenty to admire from the outside. Architecturally beautiful - lacy Gothic, stately, columned Greek Revival and massive Romanesque - most were built in the late 1700s and the1800s. Their founding congregations, however, date back much further as many of the original churches were rebuilt several times over following damage from fire, war and hurricanes. St. Michael's Episcopal Church, is the exception. As the oldest church structure in the city, it has remained relatively unchanged since its completion in 1761, managing somehow to survive Charleston's man-made and natural tragedies. Founded as far back as the late 1600s by the English, French, Scots, Jews, Irish, Germans and free slaves, these historic churches provide a continuous thread to the past. In their diversity, they stand solidly for the religious tolerance which made Charles Towne unique among the colonies. The first congregation, that of St. Philips Episcopal Church, established in 1680 by the earliest English and Barbadian settlers, was followed a year later by the French Huguenot Church, the only remaining Huguenot congregation in America. First Scots Presbyterian was founded by 12 Scottish families; First Baptist Church by Baptists forced from New England by persecution by the Puritans; Emanuel A.M.E . Church by free slaves. Charleston is home to the first Catholic Church established in the colony, and is also the birthplace of Reform Judaism in America. While you are looking, discover why the Huguenot Church was called the "Tidal Church," and the Cathedral of St. Luke and St. Paul the "Planters Church." In St. Philip's, find the pew where George Washington and Robert E. Lee both sat; admire the funerary art in the Circular Church Cemetery, the city's oldest graveyard, dating to 1696 ; learn when and why St. Michael's steeple was painted black; discover the small museum in the Beth Elohim Synagogue, the second oldest synagogue in the country. 6) Tour Ft. Sumter National Monument, the symbol of Southern resistance, and where the Civil War began. Accessible by boat only, fort and harbor tours depart from either Liberty Square at the corner of Calhoun and Concord in downtown Charleston, or from Patriot's Point in Mt. Pleasant. 7) See regional wildlife at the South Carolina Aquarium. Experience the nature in the region without having to drive anywhere! See the wild life of the salt marsh creek - herons, terrapins, puffer fish, red-tailed hawks and owls. In the Coast Gallery, explore the great variety of sea life found in Charleston Harbor and along coastline. A slog through the boggy Blackwater Swamp at twilight is unforgettable. Interactive and great fun, spend a day there and at the restaurants and shops in Liberty Square. 8) Take one of the many walking tours, each with individual appeal. Choose from one of several thematic tours from Charleston Walks: see where patriots frequented and pirates roamed, experience Charleston in the Civil War, hear the story of slavery and freedom, learn details about historic homes you might otherwise miss. The Charleston Tea Party Walking Tour ends with tea served in a private garden; Ed Grimball Walking Tours shows off Charleston as only a real local can. See the ghostly side of Charleston on a tour of the city's most haunted landmarks on one of several ghost tours. 9) Take a leisurely, narrated horse-drawn carriage tour, an interesting, entertaining way to see Charleston, accompanied by the slow clip-clop cadence of a horse (or mule), properly clad in a specially designed "diaper," changed after each trip! 10) Charles Towne Landing, the 663-acre state park on the site of the original 1670 settlement, is an on-going archeological unearthing project. Relive the life of early settlers in a re-creation of the early village and through interactive exhibits. The reproduction of a 17 th century trading vessel, the life-line of the plantations along the Ashley, brings home the importance of the river to the success of the colony. Start anywhere on the "Peninsula," the historically rich old city of Charleston between the Ashley and Cooper rivers, and walk in any direction. There's something to see at every turn - remarkably beautiful historic homes and public buildings, art galleries, antique stores, restaurants, museums, parks, and gardens. To the untrained eye, there appears to be little neighborhood demarcation in street after street of wonderfully preserved, grandly colonnaded buildings. Historic Charleston is, however, loosely segmented into neighborhood areas by history, nuance and perception. Some of the oldest streets and structures are along the Cooper River, site of the early settlement, once surrounded by a protective wall extending south to Water Street, westward to Meeting, and north to Cumberland. Present-day Waterfront Park marks the location of the first docks and wharves which gave the city life. Visit the Old Exchange Building, witness to the notable and notorious, and the colonial era Provost Dungeon, keeper of fascinating stories. Walk down Chalmers Street, Lodge Alley and Unity Alley on ancient cobblestones, discarded ballast stones from colonial sailing vessels. Photograph the 1690 Pink House , the oldest masonry house in Charleston, attend a play in Dock Street Theatre , America's oldest theatrical playhouse. Enter the early churches clustered in this area - St. Philip's Episcopal Church , the French Huguenot Church , the Circular Congregational Church, testaments to the religious tolerance of the early city. Take the Gateway Walk , past half-hidden gardens behind decorative wrought-iron gates, many made by slave artisans. Visit the Powder Magazine , the only public building dating from the original settlement, and one of the few surviving made of tabby, a colonial era building material of oyster shells and sand. This is also Charleston's thriving commercial center. Wonderful shops - eclectic, upscale, ordinary and unique - and cafés, trendy hot spots, old world dining rooms and no frills places to eat are tucked in among the architecturally significant buildings on major thoroughfares and down small ancient alleys. Discover a painting by a regional artist in the Waterfront Gallery; a coffee table book on lovely local gardens in the Historic Charleston Foundation Shop and Bookstore or in the Preservation Society of Charleston Bookstore; unusual folk art at Indigo. On and around East Bay, enjoy coffee at the Charleston Coffee House, a frosty microbrew at the Southend Brewery; settle in for awhile at The Griffin, a cozy English pub; have drink with a view at Rooftop Bar in the venerable Vendue Inn. Savor dozens of great culinary choices: McGrady's, where George Washington dined; Blossom, the place to see and be seen; Carolina's, where locals dine. Try delicious dishes at trendy High Cotton, gourmet specialties at elegant Charleston Chops, flavorful surprises on small plates a Slightly North of Broad, fresh seafood at Hank's, flavorful tapas at Meritage. 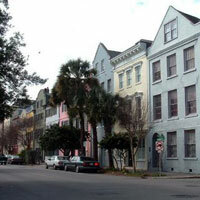 Colonial-era French merchants settled on the north side of Cumberland Street, in an area now called the French Quarter. A picturesque neighborhood with a Left Bank ambience, Charleston's artists congregate here and their galleries make interesting browsing. Some restaurants, like intimate Mistral, are distinctly French; others, near the Customs House, serve an abundance of delicious local Carolina oysters and crab. Just north is the festive Market Area, where famous Old City Market stretches from Meeting to East Bay. It's a bustling place, with vendors selling just about everything. Not to be missed are women weaving Lowcountry sweet grass baskets on site, an art form handed down from plantation days. Nearby, begin a leisurely horse-drawn carriage tour, a Charleston tradition. Restaurants- affordable or extravagant, indoors or al fresco, casual or elegant - are everywhere. Charleston Place Hotel, on the market's west side, combines a grand hotel, a complex of upscale shops, and fine restaurants. Venture north of Pickney, pass by stately Greek Revival homes in Ansonborough, the city's first residential suburb. Admire the 1792 Beth Eloh Synagogue, established in 1750, and St. Johannes Evangelical Lutheran Church, where services were conducted in German until 1924. In marked contrast to the regal columns of Greek Revival architecture is the 1712 William Rhett House, the oldest of the early single houses in the city. While not many restaurants are in this residential area, you can enjoy fresh and organic creations at FIG or reserve a table on the piazza of a single house at Cru Café. Along King Street and nearby cross streets, trendy boutiques share equal billing with shop after shop filled with elegant antiques right out Charleston's "golden era." Stop for a Lowcountry lunch at charming Poogan's Porch, or in one of the many alcoves of 82 Queen. Towards the north end of King Street, locals, visitors, and students and professors from nearby College of Charleston, the first municipal college in America, frequent small ethnic restaurants serving delicious tapas, tasty sushi, and spicy pastas. North of Calhoun Street, in an area convenient to the Charleston Visitors Center, is a collection of historically significant homes: the Joseph Manigault House, open to the public, and the private Aiken Rhett Mansion and William Aiken Home. In the area around Upper King, listen to world-class music in the Charleston Music Hall and enjoy classical or contemporary dance at The Charleston Ballet Theater. Contemporary upscale restaurants, Fish, Coast, 39 Rue De Jean, cater to the cultural crowd. The King Street Antique Mall should not be missed, and on Saturdays, March-December, find local seasonal produce and regional art in the Farmers Market in Marion Square. Nothing says affluence like South of Broad, the tree-shaded tip of the Peninsula, always a prestigious address. Some of the oldest buildings are here: Rainbow Row, where merchants lived and stored their goods; St. Michael's Church, where George Washington attended services; First Scotts Presbyterian Church, the 5th oldest church structure in the city; First Baptist Church, "mother church" of Southern Baptists. Visit the1772 Heyward-Washington House, the home of Thomas Heyward, signer of the Declaration of Independence, and the 1808 Nathaniel Russell House, open to public. The area most associated with South of Broad is South Battery, where grand residences epitomize Charleston elegance. Wealthy planters and merchants built these palatial homes with views of the harbor, and today, most are privately owned. The life of privilege of the "golden era" is visible on a tour of the 1828 Regency style Edmonston-Alston House on East Battery, or "High Battery." 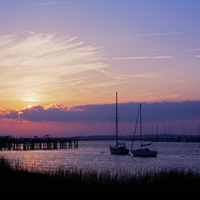 End a day in Charleston by "taking the air" in White Point Gardens, a tree-shaded sanctuary cooled by the ocean breeze. 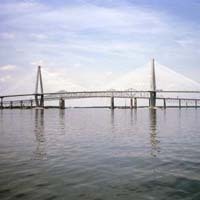 Drive over the spectacular Ravenel Bridge spanning the Cooper River to Mt. Pleasant, where remnants of the original 1680 farming community can be seen in the Old Village. Today, Mt. Pleasant is a large "bedroom" community of Charleston with a delightful small town feel. Moderately priced accommodations and casual restaurants provide a comfortable alternative to its more formal neighbor. There is a wealth of things to see and do: Patriot's Point Naval & Maritime Museum, whose floating and land exhibits include the USS Yorktown; unforgettable salt marsh vistas along Shem Creek, where working shrimp boats floating in pluff mud nestle up to marsh grass. Enjoy fresh seafood at Shem Creek Bar & Grill, or in delis, diners and oyster bars, many with shucked oysters shells piled nearby. Listen to music by a bonfire in the sand at the Charleston Harbor Resort and Marina; enjoy an oyster roast at sunset, a true Lowcountry tradition. Drive up US 17 to the Charles Pickney National Historic Site, rich in the history of African contributions to Lowcountry culture. Visit Boone Hall Plantation , a cotton plantation dating to1690, and be sure to photograph the sweeping oak-lined entrance. Find a handmade sweet grass basket at a roadside stand; browse through antique malls; enjoy happy hour at Kaminsky's Most Excellent Café. Over the Intracoastal Waterway lies Sullivan's Island, a small, quiet residential beachside community with limited commercial development. As one of the region's "sea islands" separating the marshes of the coastal mainland from the Atlantic Ocean, it has been a retreat since the 1800s for wealthy Charlestonians eager to escape the heat of summer. Today its residents are fulltime, some living in historic summer homes, others in new stilt homes along the dunes. At the northwestern end, visit Fort Moultrie, whose story begins with one of the first decisive American victories in the Revolution and ends in World War II. Further up Sullivan's Island is the Isle of Palms, yet another sea island, developed into a residential resort of over 4500 people. With many choices of accommodation, 5 miles of sandy beach along the sparkling Atlantic, shops and restaurants, it's a beach and golfing destination. Wild Dunes Resort at the very end offers it all - beaches, two championship golf courses, and world-class marina. On the other side of the Peninsula, across the Ashley River and through James Island, is Folly Beach, an eclectic beach town. The year-round resident population of 2000 swells daily with beachgoers, surfers and fishermen, attracted to the laid back "surfer" atmosphere and expansive beach. 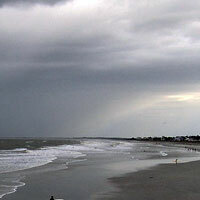 Folly Beach County Park, on the western end of the island, offers convenient amenities for beach-goers. On upscale Kiawah Island, a sea island 21 miles south of Charleston, 1000 residents share the protected forests, gorgeous stands of live oak, marshes, and beaches with guests visiting full service, luxury resorts with world-renown golf courses. The island has the area's most pristine beach, accessible at Beachwalker County Park, on the southern tip of the island. A stay at The Sanctuary is the ultimate indulgence - pampering, exquisite ocean view suites, world-class golf - all in an atmosphere reminiscent of a gracious seaside mansion of Charleston's gilded age. Go on the Gullah Tour of Charleston to experience the African influence on Lowcountry culture and traditions, told through folktales in Gullah, a lilting mix of the language of West Africa and English. Tour guide, Alphonso Brown, author of A Guide to Gullah Charleston, provides an unforgettable experience, concluding the tour at the home and forge of famed blacksmith, Philip Simmons , who carries on the heritage of his forbearers in the creation of many of Charleston's fine artistic gates. On the self-guided Gateway Walk, venture off the sidewalk to hidden places you might otherwise miss. 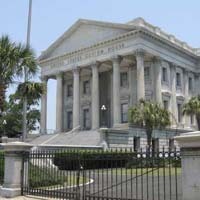 Begin at St. Philip's Church, following the subtle markers for 4 blocks, enjoying the fountains, flowers and lacy wrought-iron gates through 4 churchyards, old cemeteries, and into the gardens of the Charleston Library Society and Gibbes Museum of Art. The delightful "nature trail," ends at the double-steepled Unitarian Church. Enjoy a picnic under the shade of the 17,000 square foot canopy of the ancient 1400 year-old Angel Oak on Johns Island. The 65-foot live oak, native to the Lowcountry, is not very tall, but its canopy is enormous, with limbs as large as tree trunks, some reaching to the ground. Reportedly the oldest thing, living or man-made east of the Rockies, it has miraculously survived logging, development and hurricanes. With all the fabulous mansions to see, you might miss the diminutive Thomas Elfe House at 54 Queen, open on a limited basis for tours. Built in 1760, it is one of the oldest remaining homes in Charleston. It was the home Thomas Elfe, the most acclaimed colonial era cabinetmaker, whose work can be seen in some of the house museums. Beautifully restored in 1970, it is a showcase of 18th and 19th century furnishings, and many elements of the house, mantels, cabinets and bookcases, are attributed to Elfe. On weekends only, see one of the most interesting artifacts in naval warfare history resting in a tank of water in the Warren Lasch Conservation Center in North Charleston. The H. L. Hunley, a hand-cranked Confederate submarine lost after sinking a Union blockade ship on February 17, 1864, was discovered in mud on the ocean floor outside Charleston Harbor in 1995, and recovered with much fanfare and great difficulty in 2000. Today, archeologists are piecing together the mystery of its disappearance, confirming the long-romanticized fate of the heroic crew of eight. Drive to Summerville, "Flowertown in the Pines," the retreat of early planter families escaping Lowcountry summer illnesses and Victorian-era wealthy looking for clean air to cure lung ailments. See old homes, beautifully landscaped, on pilings with large wrap-around porches to catch the health-giving breezes, or with Victorian gingerbread details. 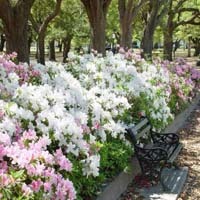 In the spring, the town is ablaze in the pink confetti of azaleas in full bloom. Get a real sense of the importance of rice to the region at the Rice Museum in Georgetown, up US 17, an area where the land and water combined to make rice cultivation and the unique Lowcountry culture possible. Along the way, stop by Christ Episcopal Church, a small "chapel of ease," one of several such hidden jewels, dating to colonial times, used by planters unable to journey to Charleston for church services. 1) Walk, walk, walk. Charleston is on display for all to see. 2) Stroll through shady White Point Gardens for a view of the harbor and Ft. Sumter. Walk along the sea wall on East Battery and look back at the splendid homes (Before you go, walk a few blocks over to Burbage Grocery on Broad Street to pick up a picnic lunch. Try a piece of their Pluff Mud pie!). 3) Window shop along King Street. 4) Discover Lowcountry art in art galleries in the French Quarter. 5) Visit Magnolia Cemetery, the oldest cemetery in Charleston, founded in 1849 on the banks of the Cooper River, and the resting place of many prominent Charlestonians. Lovely under a canopy of live oaks, its fine collection of ornate funerary art honors planters and politicians; blockade runners and secessionists; statesmen and soldiers; artists and writers. 6) Enjoy the expansive beaches - Beachwater Park on Kiawah Island, Folly Beach County Park, or the Isle of Palms County Park. 9) On Saturdays in the summer, walk through the Farmers Market in Marion Square for Lowcountry produce, food, flowers, musicians, artists and crafts. 10) See a precision drill parade by cadets at The Citadel on Fridays at 3:45 pm, when college is in session. 11) Go through the Powder Magazine , the oldest public building in the Carolinas. 12) Get to know Charleston's "Best Friend," a nearly exact replica of the first steam locomotive to offer regular passenger and freight service in the U.S.
13) Visit the early coastal fortification of Ft. Moultrie , active from 1776 until 1947. 14) If you have no fear of heights, walk along the pedestrian lane over the remarkable Ravenel Bridge to the viewing platforms 198 feet over the Cooper River. Some come to Charleston just for the fabulous food. Gifted chefs, many recipients of the prestigious James Beard award, with a following of foodies and food critics, and appearances on TV food shows, preside over creative kitchens. Menus rooted in Lowcountry traditional cooking become magic in the hands of this sophisticated talent. Lowcountry cooking itself is a fusion of the forces of history and location that shaped the region. Exotic ingredients were brought in on merchant ships from far off places; the diverse colonial population brought traditions from their country of origin; and the African influence, found in rice and, yams, okra and black-eyed peas, peanuts and sesame seeds, is legendary. The water yielded oysters, shrimp, crab and fish, and the land produced fresh vegetables in abundance. Stone-ground grits, a staple in colonial times, innovatively find their way into every menu. Wild mushroom grits and lobster basil hush puppies are wonderful at Peninsula Grill. Anson uses its own Anson Mill organic grits in remarkable ways. The Boathouse serves them with sushi grade yellow fin tuna; High Cotton flavors them with white cheddar and jalapeno, Cypress makes them into truffled cakes served with lobster. The importance of breakfast in colonial times is carried on today, magnificently. Try poached eggs on homemade biscuits with mushroom gravy at Hominy Grill, or salmon with poached egg on a croissant at Joseph's. Diana's serves a simple breakfast, and at Bakers Café , still warm freshly baked goods are just the beginning. Brunches are sumptuous - crab cakes benedict at Sermet's, lavishly presented selections in the Barbados Room, corned beef and sweet potato hash at Atlanticville Restaurant & Café on Sullivan's Island, shrimp and lobster crepe at High Cotton, and at Vickery's try the Lowcountry sauté, creamy grits topped with shrimp, crab and crawfish tails in bourbon butter, and crispy fried oysters. Long, late, lingering lunches, a tradition which began in early Charleston, continues, with many restaurants serving until mid afternoon. Some restaurants open early for dinner, serving especially delicious small plates, perfect with a glass of wine after a long day of sightseeing; others serve several-course creations elegantly set on splendid tables. 39 Rue de Jean, better known for escargot and sole meuniere, has one of the best hamburgers in town; Fast and French has great soup, delicious with a baguette, pâté and cheeses. For no frills Lowcountry fare, enjoy fried green tomatoes, collards and meatloaf at Jestines. Don't miss traditional buttermilk fried chicken at the Oak Steakhouse, or sweet potato pancakes at Poogan's Porch. Lowcountry also goes continental: wild boar with beans at Il Cortile Del Re, ravioli stuffed with collards and hamhocks at Mercato, and butternut squash ravioli at Cintra. Fresh local seafood reigns supreme. A must is the fabulous seafood tower at Hank's, the Portuguese fish soup at FIG, Carolina Bouillabaisse at 82 Queen, traditional Frogmore Stew, most elegantly rendered at Charleston Grill, local wreckfish with okra and black-eyed peas at Fish. Meat, pork and wild game are not left out. Lamb steak, quail and pheasant are fabulously prepared at Charleston Chops and Grill 225. There is a whole world of tapas or small plates, filled with savory surprises of exotic ingredients crossed with Lowcountry staples. Sample egg rolls with collards at Magnolias, crispy crab wontons at Meritage, roasted red peppers and hummus at Pane E Vino, grilled shrimp at Raval, roasted quail and maverick grits with shrimp at Slightly North of Broad, pâte at Mistral, seafood tacos at Coast, crispy salmon and seaweed salad at Chai's, calamari with Asian slaw at Cru Café, buttermilk fried calamari at Blossom, Japanese delicacies at Sushi Hiro. Desserts are creations unto themselves - fresh gelato at Modica, banana fritters at Tristan, the "ultimate coconut cake" at the Peninsula Grill, divine chocolate pâté at Robert's of Charleston, bread pudding with bourbon butter at Poogan's Porch, rich bourbon pecan pie in the Swamp Fox Restaurant & Bar. Charleston dining is not just about the food - it's about ambience too. Restaurants are cozily intimate, casually fun, grandly elegant. They are filled with antiques or sparsely contemporary. They are in grand historic homes and single houses; in old warehouses, charming gardens, piazzas, and courtyards; on waterfront piers and in creek-front shacks. Fine dining spots and casual places line East Bay and Market streets, most in renovated warehouses of the old port city. The Boathouse is in old boat repair warehouse, Anson in a 100-year-old ice warehouse, Hank's in a 1940s fish house overlooking City Market. Rough timbers set the scene at A. W. Shucks, and Fleet Landing is on a pier in a 1940s naval building over the Cooper River. Magnolia's is in the former customs house, and Hyman's Seafood Company's old building covers a whole city block. McGrady's, down tiny Unity Alley, looks almost as it did when Washington dined there. Sit in the courtyard of Palmetto Café, at the outside bar of 82 Queen, alongside tiny Fulton Street at Fulton Five. Dine elegantly in the carriage house of the Victorian Wentworth Mansion at Circa 1886, in the 19th century charm of the historic Planters Inn in the Peninsula Grill, or on the covered piazza of a single house at Cru Café. Overlook the tidal marsh at Shem Creek Bar & Grill or, for an unforgettable experience, find a Lowcounty oyster roast at a restaurant on one of the sea islands. For an truly extraordinary evening, drive to Summerville to dine among antiques and under the crystal chandeliers in the 5 diamond Dining Room at Woodlands, one of the grandest restaurants in the South.